The Red and Whites dominated the dairy judging taking the overall and junior inter-breed titles. The overall winner was Cuthill Towers Classic Ellie from the Lawrie family Milnathort, Kinross. 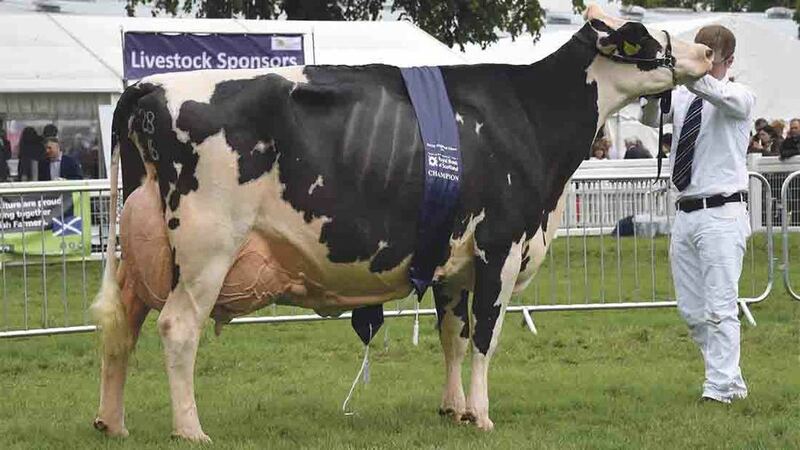 This third calver was the breed champion at last year’s Royal Highland, and also had success at this year’s UK Dairy Expo, taking the honourable mention title. She calved in November last year, and has given 8,369kg so far, following an 11,000kg second lactation at 4.24 per cent butterfat, and 3.05 per cent protein. This will be the last summer show outing for the cow, which is part of the Lawrie’s 240 Ayrshire, and blended Red and White herd. The judge, Edward Crank, Cheshire, said he liked his cows to ‘carry their milk high and wide’ and he praised him champion for her udder, which he described as being ‘welded on’. Runner-up in the inter-breed judging was a Holstein fourth calver, Blythbridge Goldwin Rosalee, from the Laird family’s Blythbridge herd at West Linton, Peebleshire. This cow, classified EX95, calved in September and has given 16,500kg so far at 290 days into her current lactation. She took the breed title at the Livestock Event and was reserve champion at AgriScot. This will be the last show for the cow, which is part of the Laird’s 500-cow herd. Honourable mention went to the Ayrshire winner – Sanderson George Evergreen from David Sanderson, Wigton, Cumbria. A third calver she calved in December and was shown giving 35 litres after a 10,000 litre second lactation. She was last year’s Great Yorkshire Show champion, and this was the first breed win at the Royal Highland for Mr Sanderson. The junior inter-breed title went to Michael Howie, Morpeth, Northumberland, with Morwick Ruth 158. This young heifer in-milk is by Poos Stadel Classic. Reserve honours again went to the Holsteins with another from the Lairds – Blythbridge Sid Jackie. In the other breeds the Dairy Shorthorn winner was David Dent who milks 50 Dairy Shorthorns at Kirkby Stephen, Cumbria. Winbrook Wren 2 is a sixth calver, which has had eight calves including two sets of twins. She calved her last in April and was shown giving 43 litres. She was champion at last year’s Westmorland Show. This year’s visit to the Royal Highland was the first time Mr Dent had shown at the fixture since 1989, when he won the breed title. The Jersey winner was Bluegrass Vindication Harp, a second calver owned in a three-way partnership between the Fleming Family, John Henning and Keith Agnew, who bought her for 11,000gns at last year’s Red Ribbon sale at the UK Dairy Day. 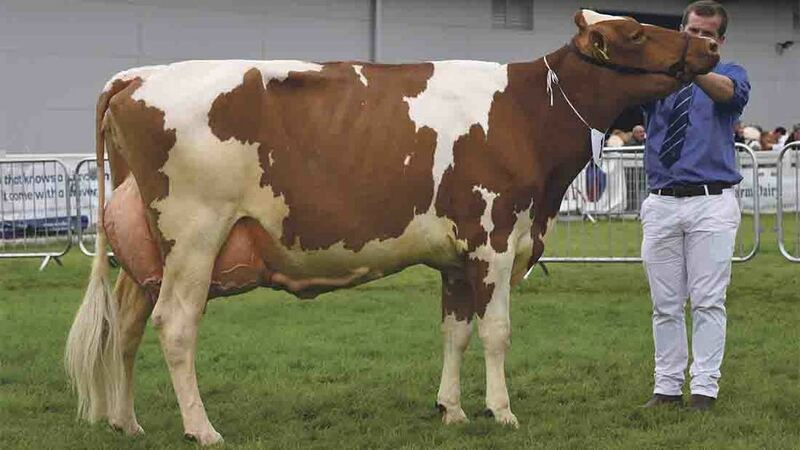 The cow, which has been Jersey champion at the last two UK Dairy Expos, is housed at Logan Holsteins in Castle Douglas. Inter-breed (Judge, E. Crank, Cheshire) Supreme, A. and S. Lawrie, Cuthill Towers Classic Ellie (Red and White); reserve, Blythbridge Holsteins, Blythbridge Goldwin Rosalee (Holstein). Inter-breed junior (E. Crank) Sup., M. Howie, Morwick Ruth 158 (Red and White); res., Blythbridge Holsteins, Blythbridge Sid Jackie (Holstein). Red and White (K.L. Davidson, Castle Douglas) Sup., A. and S. Lawrie, Cuthill Towers Classic Ellie. Ayrshire (K.L. Davidson) Sup., D.C. Sanderson, Sanderson George Evergreen; res., A. and S. Lawrie, Cuthill Towers Crown Ray. Holstein (B.J. Davidson, Gretna) Sup., Blythbridge Goldwin Rosalee; res., J. Brewster, Boclair Sid Hope. Jersey (S. Bland, Cumbria) Sup., Flemming Family; C.J. Henning; and K. Agnew, Bluegrass Vindication Harp. Dairy Shorthorn (J. Robinson, Kendal) Sup., D. Dent, Winbrook Wren 2; res., J. Teasdale and Son, Brafell Rosalyn.